Much of my current research uses a complex systems approach to address anthropological and archaeological questions. If your first thought is "what's a complex systems approach?" you're not alone. While complex systems science is no longer a "new" or particularly novel approach in many discipline, it remains unfamiliar territory for many archaeologists and anthropologists. This is unfortunate. It is also more than a little ironic considering the basic nature of many of the questions that anthropologists ask and the nature of the empirical evidence that we must use to address those questions. This is doubly true for archaeology, which is essentially a science of explaining phenomena we can never observe. Is this difficult? Yes. Yes it is. Would archaeology benefit from having a few more tricks in its arsenal? Yes. Yes it would. Is complexity science one of those? Yes. Yes it is. Believe it or not, there is no single definition of what constitutes a "complex system." Part of the reason is that "complex systems science" is an umbrella that can be applied to research in many fields: physics, chemistry, biology, economics, sociology, and anthropology. What ties it all together is a fundamental concern with how the relationships and interactions between the constituent parts of a system give rise to the collective behavior of the system. Spoiler alert: complex systems behave in ways that are unpredictable and nonlinear, and therefore often difficult to understand intuitively. 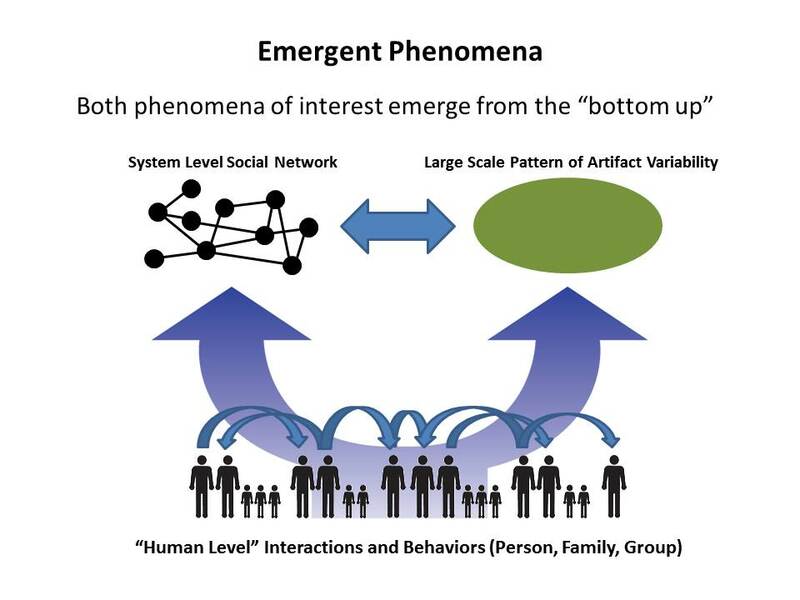 The behavior of complex systems emerges "from the bottom" up as a result of the interactions among the parts of the system (whether those parts are hunter-gatherers, ants, atoms, birds, stock brokers, whatever). The behaviors and interactions of the parts of the system are, in turn, influenced "from the top down" by system-level conditions and behaviors. These relationships between the micro and macro levels of the system are difficult to understand, making complex systems resistant to both mathematics and armchair theorizing. You can't just write an equation that solves for the behavior, and you can't just sit down with a pencil and paper and bowl of potato chips and figure out what the system is going to do. Complex systems just don't work that way. That's what makes them complex. a complex systems exhibits emergent behavior (discussed below). These elements of a definition are a good start, in some ways, all you need: complex systems can be recognized by a combination of how they are structured (with many interacting parts) and how they behave (emergent behavior). Complex systems are not difficult to identify - they are everywhere. Human social systems are undoubtedly complex systems. So are ant colonies. And flocks of birds. And schools of fish. And the weather. And ecosystems. And immune systems. And galaxies. The details of these systems are different: their constituent parts (fish, ants, people, water droplets, planets, etc.) are not the same. Yet there are striking regularities in the patterns of behaviors that these systems exhibit. This suggests commonalities in where those behaviors come from - perhaps the details of the system don't matter as much as the interactions between the parts. Ever wonder what schools of fish and flocks of birds have in common? Where do those patterns come from? Can we identify a common process or set of behaviors that explains both? Does that explanation apply to the behaviors of other systems with similar behaviors? How do we know when we've figured it out? Those are questions for complexity science. not the result of central control. Flocking birds are a great example of to illustrate some important aspects of emergent behavior. Emergent behavior can be described. The properties of the flock (its size, speed, shape, direction of travel) emerge from the behaviors and interactions of numerous birds. We can observe and measure the flock properties independently from the information about any particular bird. No central control. What is controlling the behavior of the flock? You guessed it - nothing. Reproduce it to understand it. You cannot write a mathematical equation to "solve" for the properties of the flock. 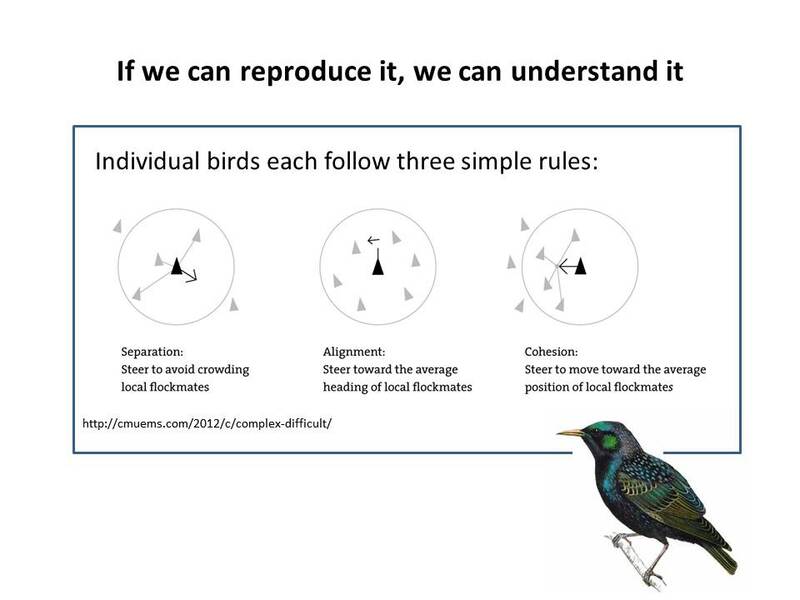 Modeling and simulation are the primary avenues for understanding emergent behavior: if you can show that system filled with agents (birds, in this case) interacting under a given set of rules can reproduce the phenomenon you're interested in, you've gone a long way toward understanding where that emergent behavior comes from. This what Joshua Epstein terms generative social science. The figure to the left (altered from the figure here) shows the rules necessary to produce simple flocking behavior in a computer model. "Agent-based models" get their name because they represent behavior at the level of the individual agent (bird, in this case). Complex behavior can come from simple rules. The interactions of numerous individual birds, each following a small number of simple rules, can produce complex behavior. What are the simplest rules and representations necessary to reproduce the phenomenon of interest? Which details matter and which don't? These questions are at the heart of choices one makes when building a model. We don't need to simulate ever feather on the bird to understand flock behavior. We can simulate traffic jams without representing the color of the vehicles. You get the idea. The structured of interaction is important. Because emergent behavior comes from interactions between parts of the system, how those parts interact is important. In the bird flock, space structures interactions: each bird is behaving based on it's immediate surroundings. Space is also an important component of interactions in most (all?) archaeological systems. This is why the study of networks (how the parts are connected together) is so critical to complex systems science. The Tyranny of the Ethnographic Record? The Tyranny of the Archaeological Record? Archaeology is tricky. We are ultimately attempting to study things that we can never observe. Yes, we do plenty of measuring, weighing, describing, gluing, drawing, labeling, mapping, and excavating of things that we can observe: rocks, pots, features, etc. We are studying those material things, however, as a path to addressing larger questions about peoples, cultures, societies, and behaviors that we cannot (and never will be able to) see. At least I am. And this is my web site, so that's what we're going with. If you want to make an argument that archaeology actually is something if it is not anthropology, be my guest. But you'll have to do it on your own web page. The nature of what we are studying means that archaeology fundamentally has to be a theoretical rather than experimental science. Just as we cannot simply observe firsthand how primary states formed, or how culture and biology articulated in human evolution, or how hunter-gatherer systems adjusted to long-term environmental change, or how human societies colonized empty landscapes, we cannot set up a controlled, real world experiment designed to determine cause and effect. Of course we can (and do) collect a lot of firsthand ethnographic information that helps us understand how people in the present live their lives and make decisions and how societies in the present are put together. But we cannot watch long-term processes of change unfold among living societies and we cannot perform an experiment to determine under what conditions a primary state will form. We are dependent upon building theory (explanations that contain generalized principles) and models (descriptions of how variables fit together) so understand what happened in the past. There are two main kinds of empirical information that we can use to understand the past: ethnographic data and archaeological data. Neither, unfortunately, is satisfactory on its own. Ethnographic data, while potentially very rich, provide only a very narrow time-space window into human behavior. Archaeological data can be expansive in terms of time and space, but are just the material residues of what we actually want to understand (i.e., the footprints of the animal instead of the animal itself). This is a mismatch in scale. These two kinds of information are not telling us the same things, and cannot easily be translated back and forth. Lyman's (2007) distinction between operational processes and evolutionary processes is useful here. Operational processes operate on human time scales - days, weeks, years, lifetimes. Do we move camp or not move camp? Should we have another child? Which resources do we expend effort to procure? How much food should we store for the lean season? Do we move the family to a different group or do we stay with this one? How do we choose where to go next? Operational processes are associated with short scales of time and space as a result of behaviors and decisions made by individuals and families based on their limited knowledge, goals, and connection to society. Evolutionary processes, in contrast, unfold over larger scales of time and space. These are the processes that underlie changes in system states: the transformation from "simple" to "complex" hunter-gatherers; the domestication of plants and animals; intensification; etc. Many classic questions of anthropology and archaeology concern evolutionary processes. Where does social complexity come from? How and why do states emerge from non-state societies? Evolutionary processes may unfold over generations or millennia across human societies spanning large areas of space, far outside the scales of observation possible with ethnography. That is why explanations of evolutionary processes must be addressed using archaeological data. Ethnography can tell us a lot about operational processes but very little about evolutionary processes. Archaeological data give us insight into sequences of evolutionary change, but rarely have the resolution to get at operational scales. Alone, neither is sufficient for understanding the past. How do we make use of both in a way that gives us a chance to construct explanations in which we can have some degree of confidence? One simple way to combine archaeology and ethnography is to create a quasi-longitudinal “line-up” of ethnographic cases that are meant to represent a developmental sequence. We know that there is some value in doing this. This can be helpful in identifying constraints (complex hunter-gatherer systems do not occur under conditions of low population pressure, for example – Keeley 1988) and broad trends and inter-relationships. Indeed, the non-random co-occurrence of constellations of attributes in the ethnographic and ethnohistorical records is what lets us identify and classify system “types” such as tribes, chiefdoms, states. Most complex hunter-gatherers have higher population densities, are more sedentary, used stored foods, have more complicated technologies and fancier status markers, etc. This lets us identify different systems, put them in an order, and ask the question “what is new in this state that was not here before? Why did it arise?” This is one avenue towards model-building. It is not a great one, however. in complex systems, initial conditions, history, and process matter to an evolutionary outcome or sequence of change. Another way is to use ethnographic societies as analogies for archaeological ones. Without going into detail about why, I will just state for now that this is a bad idea. Archaeological interpretation is filled with all kinds of models. Archaeology is a theoretical science, after all: models are required to develop expectations that we can compare to archaeological data. What is different about agent-based models (ABMs) that makes them useful? 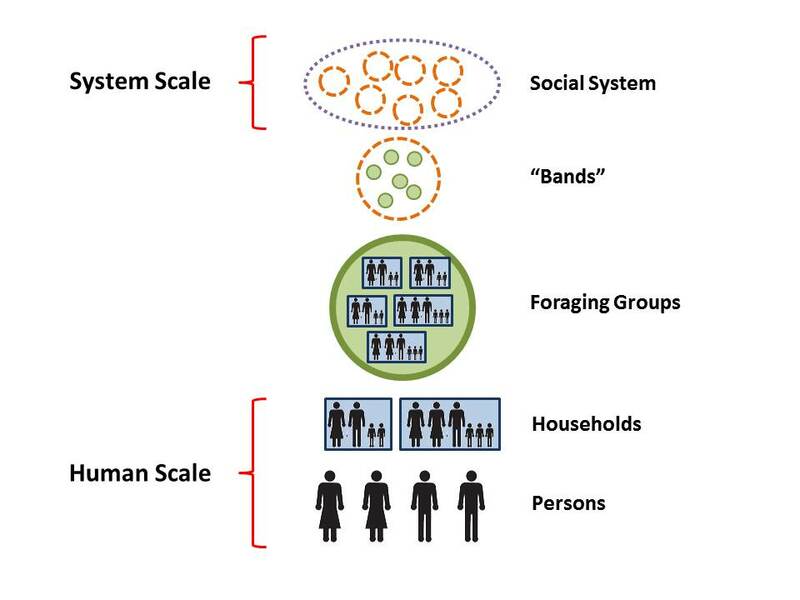 The big reason, for me, is that ABMs let you bridge the “scale gap” between the operational scales of behavior that we can understand through ethnographic observation and evolutionary scales of system change that we are often trying to understand through archaeology. Given what we know about all kinds of complex systems, the relationships between those levels are not likely to be simple. The decisions, behaviors, and interactions of individual people and families do not "map up" to the system level in a simple way. If they did, the stock market would be a very easy thing to understand and predict. In an agent-based model (ABM), we can represent the human behaviors that we can document ethnographically (such as mobility, marriage, kinship, and social learning among hunter-gatherers) as “rules” for human-level behavior. We can create a system populated by actors who behave and interact according to these rules. We can create a model "world" that has spatial features and environmental conditions that affect behavior. We can set the system in motion, letting the members of the population interact for whatever period of time we want across whatever span of space we want. We can observe the characteristics of the system that emerge as a result of the human-level interactions that are taking place. We can also design the model to record aspects of system-level behavior that we can compare to archaeological data. Even if we know what kinds of behaviors we're interested in, designing an ABM is not necessarily a simple thing to do. The art of modeling is the art of making choices about what things to include and how to represent those things. 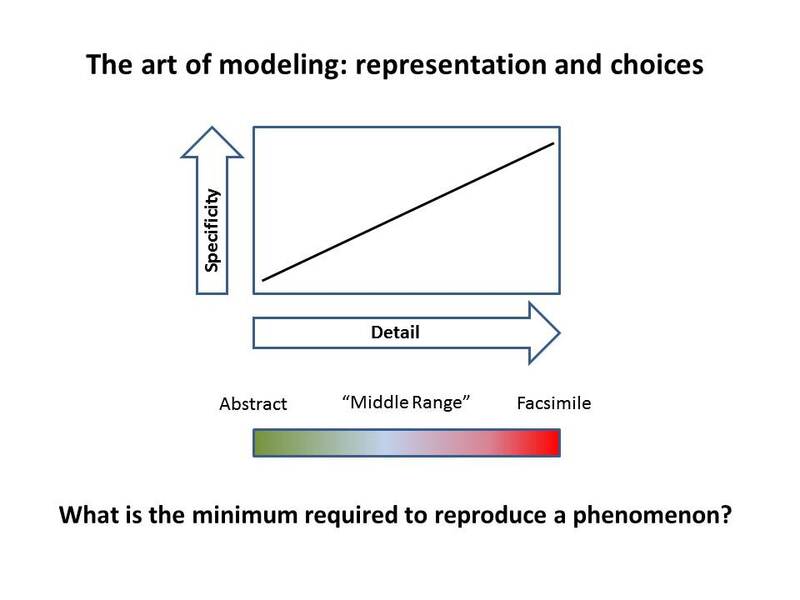 The more detailed a model is, the less generalizable it is: more specific models are generally less useful for representing a wide variety of cases. At the essence of my philosophy for computer modelling (a philosophy which many others share) is KISS: Keep it Simple Stupid. What is the minimum that is required to reproduce the phenomenon of interest? I have to admit, though, that KISS is an easier philosophy to espouse than it is to follow. It is always tempting to add more things in to a model. And it is hard to take them out once they're in there. The capacity of ABMs to deal with emergent behavior in a reasonable way are what makes them powerful tools for building both anthropological theory about how human societies work and change and archaeological theory that relates those changes to changes in material culture. If someone can show me a better way to do that, I'm listening. Complex systems science can contribute to archaeology in several ways. As mentioned above, complexity science is a broad approach that encompasses many different ways of understanding natural and cultural phenomena. I am by no means an expert in all of them (or even one of them). I was initially attracted to complexity science as a tool for doing archaeology because of the many ways I saw that it could be used to address issues central to understanding hunter-gatherers. It was central to my dissertation work, which integrated ethnographic data, computational modeling, and archaeological data to understand the social networks of early hunter-gatherers in the American Midwest. In my opinion, a general failure to demonstrate how the results of model-based analysis can be directly compared to archaeological data (the empirical data about the past) underlies some of the skepticism and suspicion of applying complexity science to archaeology. I tried to make those comparisons in my dissertation as well as in my JAA paper and a recent paper in AJPA. Archaeological data (or fossil data, as the case may be) are the direct evidence of the past. For an explanation to be satisfactory, it has to accommodate that evidence. These are just a few thoughts, to be better organized and presented in the future. The ability to set models in motion allows us to view the outcomes in terms of both the end results and the emergent properties of systems at their operational level. Long term processes of domestication, intensification, the emergence of social inequalities, etc. can be explored by setting initial system parameters (conditions) and operational processes and then letting the system run. What is necessary to cause change? What is necessary to ensure stability? The act of creating a computational model causes the creator to precisely specify attributes and variables. In order for a computer to crunch numbers and produce outcomes, it must have specific inputs. This forces the creator to clarify his or her thinking and eliminates the contribution of “black box” variables or processes. You just can't have something in a computer model unless it is spelled out in code. is a central methodological goal of archaeological systems theory (cf. Clarke 1968; Flannery 1968; van der Leeuw, 1981:232). In addition to helping us understand how a system behaves, working with model systems may allow us to derive critical archaeological test implications that were not previously considered. When confronted with a process that occurs over archaeologically short time scales (such as chiefly cycling), problems developing the fine-scale chronological framework required to evaluate models of the process could be overcome if additional criteria were developed that could be recognized archaeologically. Model-based analysis will help overcome equifinality problems. Complex systems science has shown that general principles of emergence and evolution are often generalizable to radically different classes of phenomena, regardless of the details. Similar network properties arise from similar structures (connections between parts) in the neurons of worms, the electrical power grid, and human social networks. The appearance of hierarchical organization (where one part is the “boss” of more numerous other parts) leads to a speeding up of the rate of evolution in many different contexts – multicellular organisms as well as human systems. Compare how quickly human social systems tend to change after hierarchical social structures develop, for example, to the apparent rate of change during the preceding millions of years. Hierarchy means the breaking of equivalence between parts, which allows for many more combinations of interactions. Similar ideas may apply to changes in the rates of technological evolution: the presence of more “building blocks” allows for more different combinations, which begins to produce a ratchet effect. Insights from fields other than archaeology may have a tremendous value in helping us understand the past. Human systems are "special" in that they are cultural, but that does not mean that all of the aspects of cultural systems are unique to cultural systems. Through systematic experimentation with an ABM, cause-effect relationships between human-level behaviors and emergent, system-level phenomena can be investigated as an empirical problem rather than simply assumed. That is something that cannot be accomplished with archaeological data or ethnographic data alone. This kind of work, according to Robert Axelrod, is part of what makes complexity science a “third way” of doing science, positioned between experiment and theory. It is a new way of doing archaeology, and it can do things that other avenues of analysis and model-building simply cannot. It is our new kung fu - an incredibly useful set of tools that we can use to address a host of issues in archaeology and anthropology in new way. Finally, I’m going to play the authority card again. If you don’t believe that this approach is useful for generating scientific insights about the world around us, ask Murray Gell-Mann, Kenneth Arrow, Martin Karplus, Thomas Schelling, and Ilya Prigogine. The alert will note two commonalities among the individuals in this group. First, they have all been involved in the development and use of complexity science. Second, they have all won Nobel Prizes. That's not bad company to be in when you're looking for ways to push the boundaries of what we know and what we can know.